One year ago, on April the 7th, 2018, President Lula became a political prisoner. He was sent to jail by the judge Sergio Moro, who is now the currently Minister of Justice and Public Security at the Jair Bolsonaro’s administration. Lula was accused and convicted of the alleged property of a flat in the city of Guarujá, having no proof of its ownership. He never used this private flat; nor it was at his possession and, at the time evidently belonged to a company, OAS. The prosecution of corruption against him is another aberration because according to the sentence, it is by “indeterminate facts”. But to get him out of the 2018 elections, it was worth everything. In addition to this conviction, a big list of arbitrariness committed against Lula’s lawsuit occurred frequently and has been accumulated since 2016 in a method that reveals the full character of political harassment and legal war against the greatest political statesman and popular leader in Brazilians history. The actions against Lula also show the authoritarianism and politicization that increasingly dominates Brazilians institutions that, by the Federal Constitution, should watch over the Democratic State of Law in the country. The conviction without proof that sends him to the imprisonment by the Judge Sérgio Moro last year was followed by a similar one, in another lawsuit called “Sítio de Atibaia” prosecute. In the alleged legal proceedings that compose his sentence, Lula is accused of being benefited by reforms in another property that he does not own in exchange for alleged acts of corruption that could not even be pointed out by his whistle-blowers. unions, social and popular organizations, collectives, activists, artists, intellectuals, religious, journalists, politicians, among others, to participate in the acts and demonstrations of solidarity of the INTERNATIONAL RALLY FOR LULA’S FREEDOM, from April 4th and 10th, 2019. 4. Press releases: send requests to the local press (according to the attached template) asking them to discuss Lula’s case and his political imprisonment. With the barrier of the Brazilian press, the coverage of the international press has done the important work about breaking the bubble created in Brazil, spreading the truth. 5. Meetings with parliamentarians, either by inviting them to the activities or by recording supporting videos, participating in the Tweet rally, statements in their respective parliaments, public notes, etc. 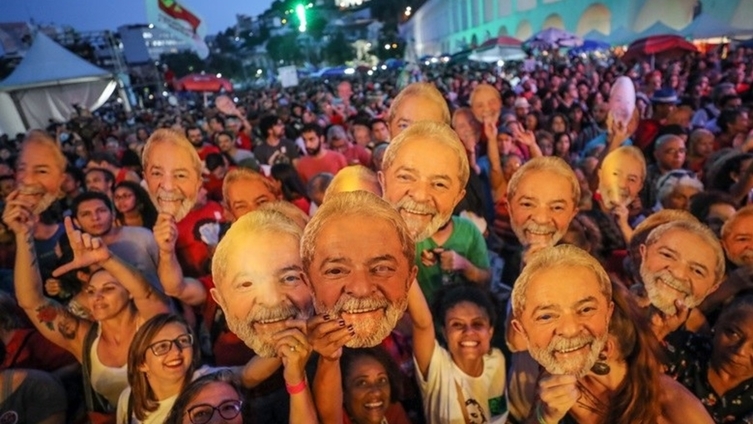 The International Committee of Solidarity in Defence of Lula and Democracy in Brazil is a broad and plural group comprised by national and international entities as well as personalities which defends democracy restoration for our country and the right of Lula to a fair and just trial.